There are some cards which I find confusing in your deck. Purphoros, God of the Forge is usually reserved for token decks or other "Go-wide" stategies whereas you are a "go-big" strategy. I also dont know how good Stalking Vengeance is. You are not a sacrifice based deck so this is just a lot of mana for some incremental damage. Then there's Sun Titan . It just doesnt seem like you have a lot of targets for him to bring back. Perhaps a fetchland or a mana dork that got killed early but not much else. Doesn't seem worth it. Then there's some other cards. I prefer Terastodon over Woodfall Primus . And why Sylvan Scrying and no Kodama's Reach ? I'd also consider adding just one more haste enabler. You have multiple creatures that want to be attacking right away like Etali, Primal Storm , Ilharg, the Raze-Boar , Balefire Dragon plus all the eldrazis. May I recommend Rhythm of the Wild ? Seems really solid in your deck. 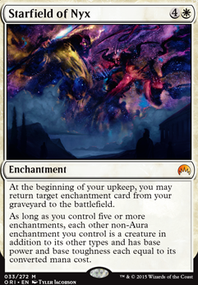 Here are some other cards you could consider: Elvish Piper , Aura Shards , Decimate , It That Betrays , Void Winnower , Blasphemous Act , Avacyn's Pilgrim , Regal Behemoth . Mana dorks don't seem like a horrible idea actually. Turn 2 loxodon smiter into turn 3 siege rhino seems nasty. I'd probably suggest going a bit higher on the curve, dropping some fleecemanes and a few removal (as mentioned above), and adding more wilt-leaf liege, maybe Thragtusk , and some Mana creatures ( Birds of Paradise , Avacyn's Pilgrim , Noble Hierarch if you have them) Hope this helps! 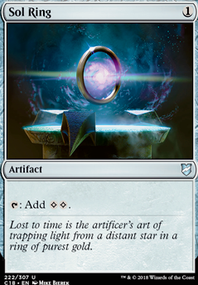 Looking at you mana curve, I think that you could easily go down to 20 lands and be just fine. 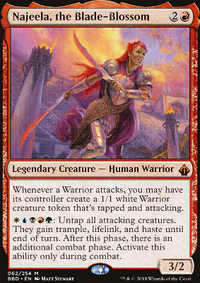 And If you are running 34 creatures, I'd suggest Collected Company unless this is supposed to be a more budget version. 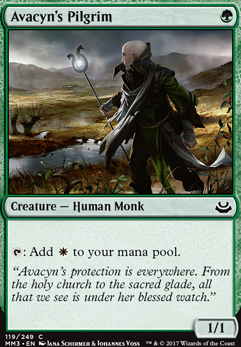 If it isn't supposed to be a budget version I would also suggest swapping Noble Hierarch in place of Avacyn's Pilgrim because it has 2 of the colors you need as apposed to just one. I am also going to suggest Path to Exile / Lightning Bolt / Lightning Helix because any deck needs at least a little bit removal. Thalia's Lieutenant is amazing in any humans deck. Militia Bugler could tutor up every creature you have except for Kessig Malcontents . If your deck relies on +1/+1 counters, I'm going to suggest Hardened Scales and Abzan Falconer . I think that you COULD splash G in exchange for the nonhuman creatures here, those being Angelic Overseer , Dearly Departed and Commander's Authority . 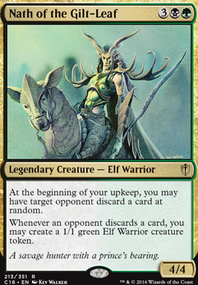 In splashing Green, you get access to extremely powerful cards in the form of Tireless Tracker , Harmonize , Dromoka's Command , Hardened Scales , Avacyn's Pilgrim and of course the ever popular, ever relevant Collected Company . I have a deck similar to this, splashing G to great effect here: Thalia's Horde of Humans. On the other hand, if you don't want to splash G, Abzan Falconer could be a good finisher.